After all the Brexit efforts and deadline extension agreement, GBP doesn't care. AUD and NZD dipped a little upon release of Singapore GDP and the Monetary Authority of Singapore decision. While it pays to be careful of attributing causation to correlation the timing was strongly suggestive of impact on the two 'risk' currencies. GDP beat for the q/q but missed y/y. The Monetary Authority of Singapore (Singapore's central bank) released its policy decision at the same time, leaving monetary policy unchanged (unchanged) after two consecutive tightening decisions previously, citing 'eased' growth and inflation expected to remain contained. Trade issues weigh on Singapore, and also on Australia and New Zealand. EUR was soon to become the centre of attention, though. EUR drove higher around the time of the Tokyo fixing. EUR/USD moved from circa 1.1260 to above 1.1290, and dropped back a few points from there. EUR/JPY surged above 125.70 to highs circa 126.20, taking USD/JPY above 111.80. 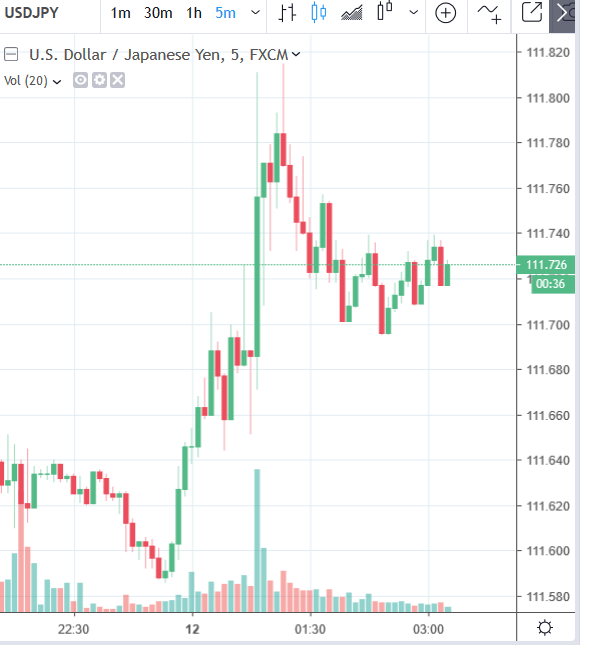 EUR/JPY buying seemed to be the underlying driver; it may well have been related to the 6.3bn USD MUFG pruchase of DZ Aviation (this news has been around for a while but chatter was of transaction-related flows). News was about that Herman Cain was likely to withdraw his candidacy for the Fed. Please note that Cain's chances were pretty much brought to zero during the US Thursday session when a number of Republican Senators came out against him. Also reported today were remarks from Federal Reserve Chair Powell (see bullets above). The Financial Stability Report was next, which outlined the numerous risks to stability. The Australian dollar dropped back towards its session low upon release but as I update has not extended further. Still awaiting the China trade balance data for March. The timing of this release is uncertian, its recectly been around 0300GMT but today, well, no it hasn't.